My son Scott and I took our lowered street Jeep Cherokee off road to the XJ meeting in the Windrock off road park. We expected to have to catch a ride or just watch. We were amazed at the capabilities of the Stock Jeep as we made it through with little difficulty. 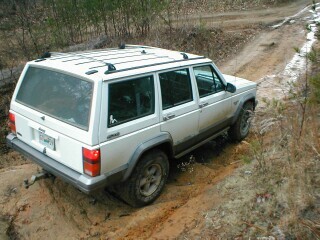 Of course we did not try the trail that rolled Neal's XJ or the Rattle rock trail. We did get some funny looks from the ATV riders.